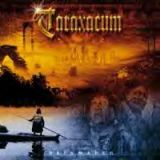 As many of you may know Taraxacum is the second band of Tobias Exxel from Edguy and also home to Rick Mythiasin and Ferdy Doernberg. While their first album Spirit of Freedom, was a little on the safe side of hard rock, nothing too wild, Rainmaker takes things up a few notches. For one it is more ballsier with songs like Disfunctional hitting you hard and fast. The riffs are stronger and more memorable as well. Speaking of Disfunctional that is a perfect opener, it has some cool sounding slide guitar in it with rebellious independent lyrics and some great high notes by Rick. There’s some Indian leanings in the title track with some tribal drums and Shaman chanting. Another killer song with some chuggy riffs and memorable chorus. The band also takes a stance on what’s happening in the Middle East right now with Prayer in Unison, a diatribe against what’s going on in Iraq. With lyrics that criticize the US’s motives and plan of action the words are deep and the music is enjoyable. Things get a little too preachy though in one of the songs where there’s some announcer guy talking about how many nuclear bombs there are in the world and all that stuff. I could have lived without that and it wouldn’t have made me cry. Dark Sunglasses seems like an ode to that 80’s new wave song I Wear My Sunglasses at Night the lyrics are very similar but instead of cheesy 80’s synth pop its cool melodic metal. If I had Known and Lo Que Falto are the same song just the latter is done in Spanish. It’s a good ballad mainly driven by piano and on both If I Had Known and Lo Que Falto there’s even some mandolin thrown in. The rest of the tracks on Rainmaker are all similar in nature. They’re mostly light hearted rock songs that pack a punch to them though some aren’t too memorable. The album starts off with its three strongest tunes but then gets bogged down a little over halfway through with a couple of medium tracks before coming back with a strong finish. Despite being a serious band of the musicians involved there seems to be an air of fun sensibility about the music. I enjoyed Rainmaker even if it isn’t the most innovative and world changing album out there. Taraxacum delivers a solid album and fans of the debut will like this better, more focused sound.